Greg has been working with a camera since 1978. 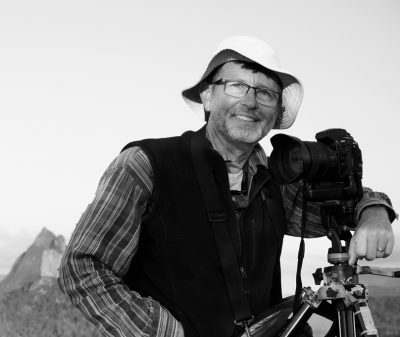 With his wife Judith, Greg has operated the business of Greg Miller Photography on Queensland’s Sunshine Coast since April 1994. Prior to that, in 1980, he and Judith self-published the book “Cooloola – Queensland unique coastal wilderness” of which they sold over 9,300 copies during a 3 year period. In November 1981, Greg joined the photographic department with the Sunshine Coast Daily and worked as a press photographer with the Sunshine Coast Newspaper Company until April 1994. Whilst working as a press photographer, Greg received over 20 awards for his photography. After leaving the newspaper he operated a small wedding, portrait and commercial photography studio at Noosa Junction for 7 years before relocating the business/studio to Buderim in November 2002. Greg maintained this small shop-front studio at Buderim till January 2012. In 2008, Judith and Greg produced and self-published the book “Kids of the Sunshine Coast” which was a fundraising project for the Make-A-Wish Foundation, Australia. Since 1994, Greg’s photography, apart from weddings and family portraits has included the coverage of many conferences at various Sunshine Coast resorts, along with teaching journalists how to take news-style photos to compliment their stories. He has also covered many jobs for the University of the Sunshine Coast and for The University of Queensland, numerous conferences at Sheraton Noosa, Hyatt Regency Coolum, Novotel Twin Waters Resort, Sebel Maroochydore and Oasis Resort Caloundra as well as photographing school formals, debutante balls and dance concerts. Greg was the official photographer for the Sunshine Coast Dance Eisteddfod for 12 years. He worked for The Gympie Times in Gympie as one of their photographers from October 2014 to October 2015. From 2016, Greg has been a volunteer photographer for the Friends of Maroochy Regional Bushland Botanic Gardens, Tanawha on Queensland’s Sunshine Coast. “Our Message” is a 60 page, A5 format hard cover book with a novelty twist. The book is a compilation of 10 testimonies and 1 testimonial poem from ordinary people sharing their Christian faith. Primarily, it is designed as a gift book for Christians to share confidently with a non-Christian knowing that it contains the testimonies of other Christians supported by biblical references, providing the reader with a clear understanding of the Christian faith. Uniquely, the book has ten pullout postcards featuring beautiful artscapes with envelopes inside the back cover.